Los Angeles continues to serve as a representative of Mexican culture and heritage in a "hidden gem" known as the Campo. Not long ago, this was Mexico. Now, Los Angeles is the second-most populous city in the United States. While it no longer belongs to Mexico, it remains, in many ways culturally Mexican. Campo de Cahuenga Museum sits in LA’s San Fernando Valley and marks the location where the declaration that ended the Mexican American War was signed in 1847, laying the foundations for California and the region’s transfer from Mexico to the US. Towering above it are symbols of the city’s Hollywood veneer: Universal Studios Hollywood theme park, film studios, a movie theatre, restaurants, shops, office buildings, hotels and a newer Harry Potter theme park. Throngs of excited visitors arriving at the subway beside the museum inevitably overlook and pass it on their way to their entertainment. The historical society that runs it describes the museum as a “hidden gem” that society members have long struggled to popularise with family-oriented community activities including arts and crafts and “ice-cream socials”. Hannah Almstead, an octogenarian California history enthusiast, teaches a handful of children who stop by at the museum how to quilt. “We have to keep our history alive – it takes a lot of grassroots people to keep it alive,” she says of her handicraft, designed to coax the young out of a smartphone and video game-induced daze. “I didn’t know this was here!” exclaims a young Mexican American boy stepping through the door as the museum is about to close in the afternoon. Californian children learn in school that the state became a part of the US with the signing of the document at this location, and the subsequent Treaty of Guadalupe Hidalgo. The museum staff laugh at the young man’s proclamation. Virtually no one knows this is here, they retort. It’s a historical site, owned by the state and operated on a modest budget, mostly private donations from Universal Studios and other community stakeholders. The Campo is a reminder of the city, state and country’s Mexican heritage which lingers prominently in the state’s social, cultural and political intersections. There are more than 1.2 million Los Angeles residents who self-identify as of Mexican origin, according to the 2010 US Census. They constitute around one-third of the city’s population. 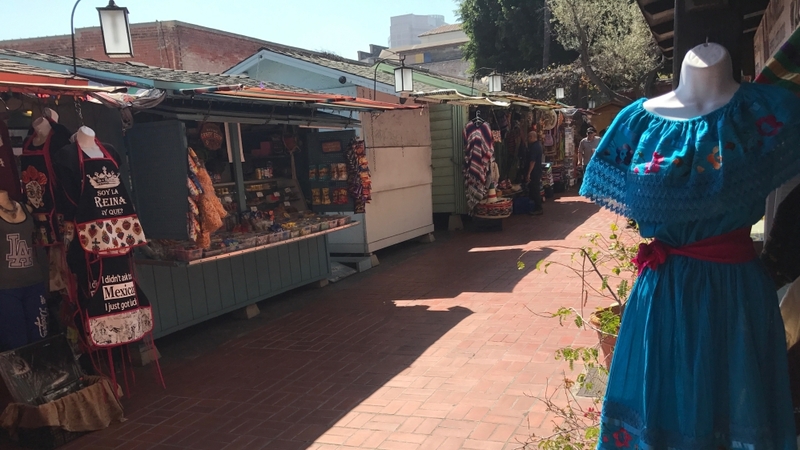 Olvera Street is a picturesque tourist attraction – a cobblestone alleyway with Spanish colonial buildings, nestled in the heart of industrial, smoggy downtown Los Angeles. It’s lined with restaurants and stalls selling Mexican kitsch. The street and environs are at once a Mexican American cultural hub and a place where that culture is sold to outsiders engaging with its most superficial traits: Mariachis, Spanish fans and burritos. The stalls here sell Mexico’s ubiquitous caramel, coconut and tamarind candies. Shop owners say that in recent months, the best-selling souvenir – among the more stereotypical Mexican sombrero hats and ponchos – are purses, shirts and totes bearing the iconic face of Mexican artist Frida Kahlo- popular with the neighbourhood hipsters. Cielito Lindo, a taco stand that’s been here since 1934, sells its famous taquitos in avocado sauce, to a line of customers that coils around the souvenir vendors. The Council of Mexican Federations in North America can be found hidden in a building. The non-governmental organisation, among other things, counsels community members on how to cope with raids against the undocumented community – not just of Mexican origin, but other Spanish-speaking undocumented people as well. For them, Olvera Street represents not just Frida Kahlo purses and taquitos, but much-needed legal aid. Aztec dancers in ornate feathered outfits perform to pan-flute music in the courtyard beside Olvera Street. For those dancers, and their audience, Olvera Street is a platform for the preservation of some of the indigenous culture of what is now Mexico. “Los Angeles is a schizophrenic city,” says Ernedina Delgadillo, curator at a nearby Mexican American museum LA Plaza of Arts and Cultures. “One that, since its American adoption, has always looked to the future and run from the past. Olvera Street embodies this perfectly”. In the 1930s, a non-Mexican high-society woman called Christine Sterling, having lobbied the city’s leaders, converted what had historically been a Mexican community living in this space into a tourist attraction. 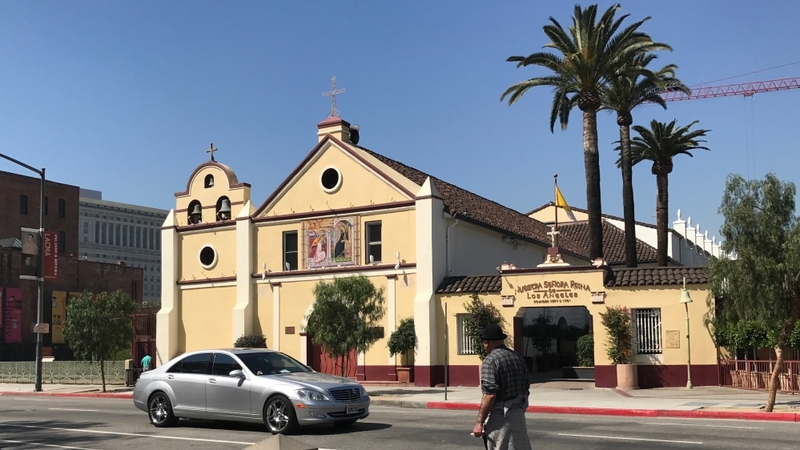 Our Lady of Los Angeles Church, was founded as a Roman Catholic mission in the Franciscan order in 1781. 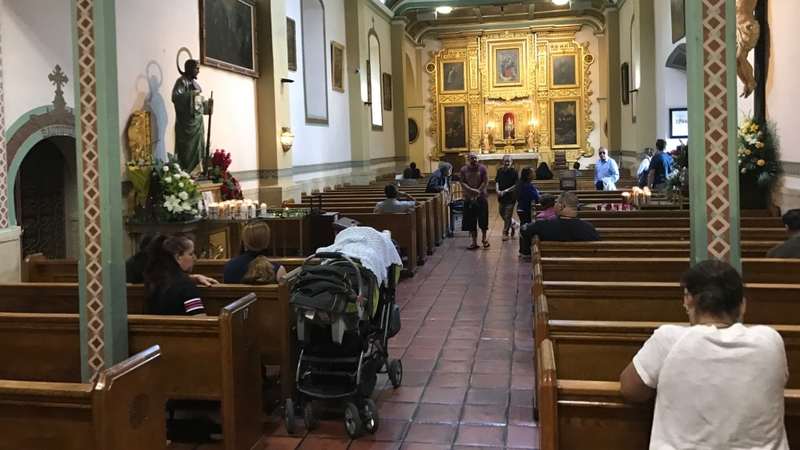 On a given Sunday, about 4,500 parishioners attend one of nine masses. In the courtyard of the Spanish-colonial-style church complex, foods and Mexican cultural items are sold. Families dress in their finest clothes. Babies are baptised. The young receive their first Eucharist. Lovers are married. Women, dressed in elegant gowns, receive special blessings for their 15th birthdays, before a heavily ritualistic party signifying their coming of age – the quinceanera. This church is an agora, where people in the community meet. For some, it’s about retaining the Mexican culture, for others it’s social and for many, it’s about organising for social justice. The church’s pastor, Father Arturo Corral, a trained industrial engineer who found his calling in the priesthood, was born in the northern Mexican city of Carreras to a migrant labourer who worked in the fields of Sacramento, in California. Corral’s mother was a secretary for Catholic Action, a social justice group renowned in the US for its work on labour rights. Popular supermarket chains in the city, Von’s, Ralph’s and Gelson’s, invariably have a Latin Foods section with Mexican staples – at the very least, tortillas, salsas and often candles with saints used for religious purposes. 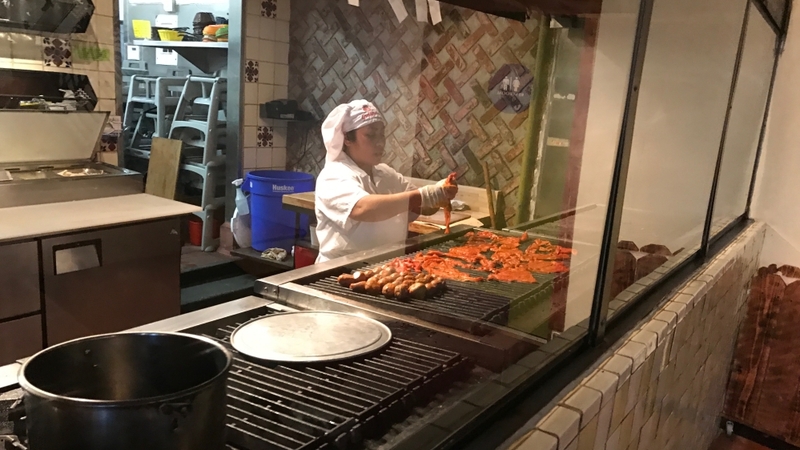 In more predominantly Mexican neighbourhoods, sprawling Vallarta markets sell more Latin American goods, different baked goods, various kinds of coffee and chocolate beverages. Corral is busily putting together manuals for the undocumented members of his community who are facing deportation by an increasingly adversarial Trump administration. The manuals – sponsored by the Archdiocese of Los Angeles Office of Life, Justice and Peace – are entitled “Preparing your family for immigration enforcement.” The manual is in Spanish and English because many of the undocumented people of Latin American origin in the US came as children and do not read Spanish proficiently. The manual encourages undocumented parishioners to develop emergency plans. It features examples of invalid warrants for their arrest. It also features an affidavit that allows undocumented parents to grant temporary custody of their children to a friend or relative. Since Trump’s inauguration, a number of US media outlets have reported undocumented parents being separated from the children who, born in the US, have US citizenship – in some cases immediately after dropping off their children at school. About a tenth of the city is undocumented, according to a study from LA’s University of Southern California. That includes not just Mexicans, but also Central Americans, Asian Americans and indeed people from all over the world. Back in May, US Immigration and Customs Enforcement (ICE) told US media outlets that the number of immigration arrests and deportations in the first five months of the year had risen by nearly 40 percent as compared with the same period the previous year, while Barack Obama was still president. Obama, who had earned the reputation of “deporter-in-chief” among many, oversaw more deportations than any president before him, expelling more than 2.5 million people, according to the Department of Homeland Security’s statistics. Trump, however, has pledged to outdo his predecessor, vowing on the campaign trail last year to deport as many as 11 million undocumented people. “All who come here are very religious. They respect faith, and I think they are also good citizens. We must give a place to them. It is not right to create fear in the people. It is not good in the government to create the sense they are not good,” Corral says. The reasons for supporting undocumented Americans and, more broadly, honouring the Mexican American immigrants among them, need to be deeper than economics, Corral argued. The immigrants themselves – both documented and otherwise – aren’t just here to make a buck. “People are here because we are hungry not just for the bread of every day – hungry for justice, freedom, expression, future,” he said. Grace is Mexican American woman in her thirties. She is a mother and a worker with a professional degree. She has spent most of her life in Los Angeles. Since her arrival, she’s forgotten how to navigate Mexican social nuances and lost whatever semblance of a community she had as a child. She’s uncertain what she’d do if she ever had to return to Mexico. I don’t have any friends in Mexico. I’ve forgotten everything about Mexico. Grace’s children, who were born in LA, are US citizens. She and her husband are not. Many families in the city – of Mexican origin and otherwise – are split like this, documented and undocumented. Grace spoke to Al Jazeera at a fast food restaurant in the San Fernando Valley, after her work at an office. Grace has a professional degree. She’s been working long hours, since her teens – and paying taxes all that time. According to a February 2016 study from US think-tank the Institute on Taxation and Economic Policy, undocumented Americans pay $11.64bn in taxes annually. She spoke quietly not wanting to be overheard and asked to remain anonymous. She leaned in over the table, eyes wide with intent, her hair pulled back into a bun. She spoke of her conviction that undocumented Americans must continue to have their stories told, particularly amid the government’s apparent efforts to stifle their voices. Grace came to LA from Mexico when she was a teenager – crossing the border without her family – led by the so-called coyotes, border crossers whom migrants pay large sums to help them on the life-risking journey over the border. It’s a gruelling journey she says she’s lucky she survived, but she felt she had no choice. Since 1998, between 249 and 492 people have died each year while making this journey, according to official data from the US Customs and Border Patrol. “I come from a family where my dad is macho. He said women are for the kitchen and not to study or have a better life or go to university. And money was everything,” she said. The treacherous trip across the border was just the beginning of what for her has been a lifetime of struggles; for well over a decade, she’s lived in the shadows. “You want to live – to enjoy your family, but you’re always afraid. Afraid someone is going to come and ask you for your papers,” she said. Despite programmes and organisations encouraging and offering to help her apply for citizenship, she’s afraid any attempt to become a full American citizen will put her on the radar of immigration authorities. 2017 is officially the Year of Mexico in Los Angeles. While Washington’s relationship to Mexico City suffers, LA has formally sidestepped the federal authority in international relations by signing a memorandum of understanding with the Consulate of Mexico in Los Angeles dubbing 2017 the Year of Mexico. The city will highlight existing events – open to the public – that aim to reconfigure prevailing views on Mexico in the US through art. On a Friday afternoon, Alina Escarcega, a former traditional Mexican folklorico dancer, busily puts the finishing touches on a party at the consulate’s cultural centre. The theme this month is Baja California, a Mexican state that borders the US. This state is where international migrants are currently amassing to attempt to cross the frontier into the US. Another theme of this month’s cultural festivities is lucha libre – Mexican traditional wrestling. There is a photo and art exhibit focusing on the iconic symbolism of the martial art by renowned Mexican American photographer Oscar Zagal. For many Mexicans, these fighters, or luchadores, represent a kind of quintessential strength. In the past, Mexican consulate functions in Los Angeles were suit-and-tie affairs aimed at an exclusive few, Escarcega said – but this sort of event has welcomed a much broader Mexican and American public. At this event, a local cumbia band plays to a dancing audience of local community members – Mexicans and non-Mexicans, some dressed to the nines, some wearing baseball caps and jeans. Local Mexican and Latin-owned businesses – a tequila vendor and a fruit juice vendor – offer the audience free drinks. They support these events both to popularise their brands in the community and as an act of patriotism, Escarcega said. 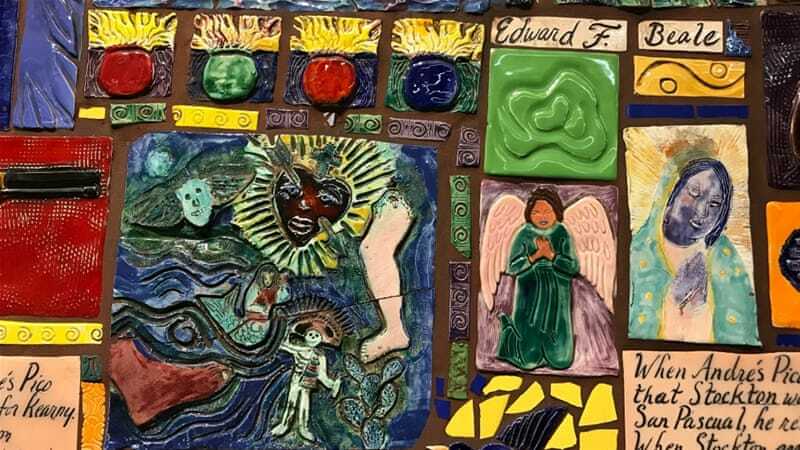 “This initiative is involving a lot of institutions, a lot of people, a lot of artists who are interested in showing people a real face of what Mexicans are,” said Andres Webster, consul for educational affairs and coordinating the Year of Mexico. Antonio Villaraigosa, former LA mayor from 2005 to 2013. Villaraigosa was the first person of Mexican origin in well over a century to be mayor of Los Angeles. His office is located in an office building with other political groups and companies – many involved in film and the performing arts that are American soft power. “I think in California, we need to acknowledge that we are the sixth-largest economy [in the world] in no small part because of the contributions of immigrants, including the undocumented. As a result, here in California, we revel in our diversity, and welcome our foreign-born,” he said. A pillow from the popular television series Veep and Villaraigosa bobbleheads decorate his office. Maps of California and targets speak to his upcoming campaign for the of office of governor. “If this administration wants to build walls, we’ll build bridges over those walls,” he said. Villaraigosa grew up in the Boyle Heights neighbourhood in the 50s and 60s. Today, Boyle Heights – and more broadly East LA – exemplify the gentrification of poor neighbourhoods sweeping across the US. A rapid hike in rents, as property moguls put luxury housing in this place for the young, hip and wealthy urban dweller, is driving many in this long-standing Mexican American community out of their homes. In April, community members rallied against what they described as unprecedented rent hikes, local media reported at the time. In some case, landlords had raised the rent by as much as 80 percent. In the nearby Arts District, a two-decade community favourite, La Reyna Restaurant, serves Mexican American classics – mulitas, meat and cheese as mortar between two corn tortillas, and burritos stuffed with “lengua” (tongue) and “cabeza” (head parts). With expensive boutiques and art studios seeking an eclectic urban vibe coming to the area, the restaurant was priced out of the neighbourhood in November after the rent was raised several times. Now, they operate a truck literally outside of their closed restaurant space. They are actively looking for a new home, the owner said. With the firm belief that justice is on their side, community stalwarts like La Reyna, stand their ground with the help of grassroots organisations fighting to keep communities intact – even if that means serving food from a motor vehicle. 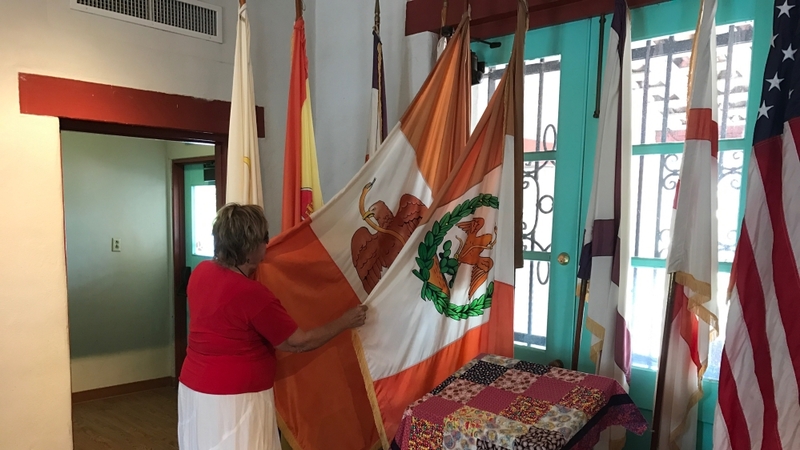 Back at Campo de Cahuenga – the site where Los Angeles ceased to be Mexico – the Historical Memorial Association president, Deuk Perrin, spoke to the importance of Mexican heritage in LA. The fact that this place was Mexico is important, said Perrin, a 77-year-old who is not of Mexican origin. “If you look at the flags that were flown – you’ll see a number of Mexican flags. That history is very important,” he said. 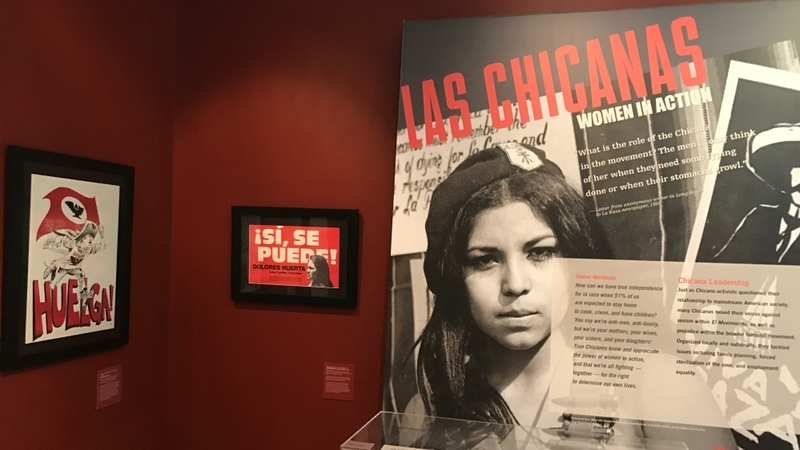 Laura Pulido, professor of ethnic studies at the University of Oregon specialising in Mexican American studies, while visiting the museum, observed that descriptions of the Mexican nationals of the time appeared to whitewash over their resistance to US encroachment on their homes. Pulido spoke at the museum with Jason Vega, vice president of the San Fernando Valley Historical Society, who agreed with her that the history told by this place changes drastically from different vantage points. Vega is of Salvadorian and mixed European origin. But he counts himself as culturally Mexican, because the part of Los Angeles where he came of age is predominantly Mexican American. “If you’re a native Angeleno, it’s impossible not to embrace Mexican culture,” he said.